Indoor Squirrel Pest Repeller - Large House, is for repelling, deterring, stopping and getting rid of squirrels within the house or business. This unit is for INDOOR use only. Our Indoor Squirrel Pest Repeller - Large House, is an ultrasonic and electromagnetic plug in device. 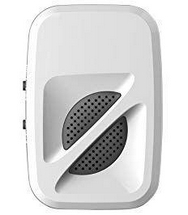 The ultrasonic part of this repellent unit is twice as strong as the ultra sonic part of the Indoor Squirrel Pest Repeller - *Small House* which is for a smaller property. Squirrels can find their way into attic, loft or roof spaces where they can cause problems by chewing at electrical wiring or water pipes. You have to use the ultrasonic and electromagnetic settings to drive out these rodent pests. Then the entry point should be located and blocked up. Plugs directly into a plug socket, but if you do not have a plug point in the loft / attic [ where squirrels are normally the problem ] you can use an extension cable.